Two University of Washington scientists have just published a study in the journal Conservation Biology in collaboration with colleagues from Rutgers University and Dalhousie University arguing that the gloomiest predictions about the world’s fisheries are significantly exaggerated. The new study takes issue with a recent estimate that 70 percent of all stocks have been harvested to the point where their numbers have peaked and are now declining, and that 30 percent of all stocks have collapsed to less than one-tenth of their former numbers. Instead, it finds that at most 33 percent of all stocks are over-exploited and up to 13 percent of all stocks have collapsed. It’s not that fisheries are in great shape, said Trevor Branch, the lead author of the new study; it’s just that they are not as badly off as has been widely believed. In 2006, a study in the journal Science predicted a general collapse in global fisheries by 2048 if nothing were done to stem the decline. The work led by Dr. Branch is another salvo in a scientific dispute — feud might be a better word — that pits Dr. Branch and his co-author Ray Hilborn at the University of Washington’s School of Aquatic and Fisheries Sciences and their allies against scientists at the University of British Columbia and their partisans. 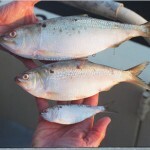 The latest paper argues that the methodology resulting in the most dire estimates, derived from records of the amount of fish caught, is not as accurate as data from the more broadly based United Nations assessment, based on the estimated biomass of available stocks of individual species. When the catch-based approach was applied to data on 234 global fish stocks from 1950 to 2006, it showed that 68 percent of all fisheries were either over-exploited (46 percent) or collapsed (22 percent) by the end of that period, while none were increasing. 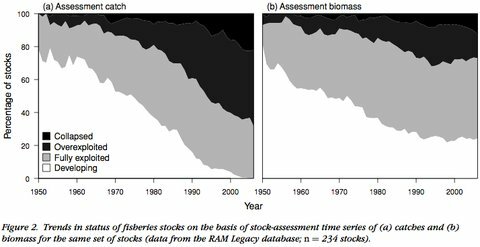 By contrast, when an assessment is based on an estimate of biomass, it showed that 28 percent of fisheries were either over-exploited (15 percent) or collapsed (13 percent). The second method also indicated 24 percent of the stocks were increasing. But Dirk Zeller, a scientist at the University of British Columbia who is on the other side of the debate, doesn’t buy all of Dr. Branch’s arguments. Yes, he said, using fish stock data is preferable to using catch data. But if reliable fish stock data is only available in developed countries like the United States or Australia — where fisheries management is reasonably well developed — what good is it in determining what is happening in the rest of the world? Dr. Zeller added that 234 stocks are a tiny subset of thousands of species currently being fished, not a sample from which one can derive broad conclusions. Yet scientists on both sides do cede a little ground. “I have no argument with the point that with stocks that are well managed you can have sustainable fisheries,” Dr. Zeller said. He pointed out that he and Dr. Pauly have adjusted their online database to reflect a critique by Dr. Branch that their analysis had given short shrift to rebounding fish stocks. But he does maintain that data from catches are more applicable on a global scale than other data sets. Dr. Branch, for his part, says that catch data has value for some uses as long as it is handled with care. Even without the aid of mathematical modeling, it is possible to predict that fish population debates themselves will remain sustainable for some time to come.